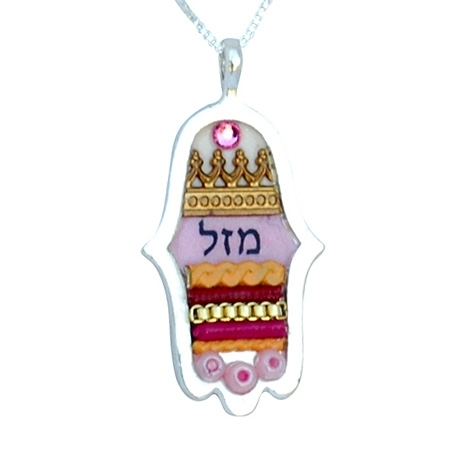 Designed by Ester Shahaf, this lovely Hamsa Necklace is handcrafted with enamel and decorated with beautiful Swarovski crystals and bead patterns. The Hebrew word "Mazal" described on the Hamsa, means "Luck" while the Hamsa itself is a symbol of protection from the evel eye in the Jewish tradition. Ester shahaf successfully combines oriental, traditional elements with a modern, shiki design. A perfect gift for your loved ones in any occasion. But disappointed with this necklace, I have purchased it in the past and the design is pretty, but this time it looked shoddy. You could see the glue where the design had been glued on and part of the design was crooked. Maybe this is why it was on special? Copyright © Ester Shahaf Judaica from Israel. All Rights Reserved.